I’m in a strong Old School mood since moving out of my parent’s home in January (and finding it increasingly annoying the fact that I can’t find local players with the same interest). It’s curious now to see how it all started. I can say that the initial responsible was Castles & Crusades, for showing me I way to play D&D that I had nearly forgotten. 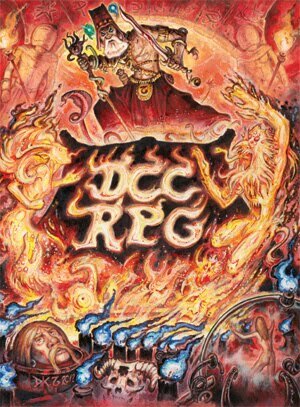 The first RPG I bought and run (at ‘94 I guess) was the brazilian translation of the D&D Basic Set (15th printing, the Black Box). But I spent the entire 90’s running AD&D 2nd campaigns. With the coming of the 3rd Edition, with its comprehensive (and very detailed) rules system, designed along different principles, I forgot how the old approach resulted in a very different style of gaming. With less powers and abilities, characters with more traditional concepts (I could also say “character that looked more like Ulysses or Conan rather than Kratos or Cloud”) and rules that most of time took a back seat to the action and role-playing, these old games inspired my group to act more by improvisation and collaboration than in recent editions. A strange side effect was that our sessions tended to be less dramatic (or epic in scope), but a lot more fun. In other words: we played closer to Jack Vance than Tolkien. After Castles & Crusades, I was totally hooked by Swords & Wizardry. From it, I started reading retro-clones, but no one really provoked the same reaction. So I took the only logical step left: I started reading the Original Edition, then Chainmail. Each of those games showed fascinating aspects of my favorite RPG, and some pleasant surprises (like Chainmail’s different combat systems, a feature that I believe would help most of the today fantasy games). From the LBBs and Chainmail, I “turned around” and begin to read the Supplements, Holme’s, AD&D 1st… and I’m still busy with it, always learning some cool forgotten rule or new perspective. Recently I was totally enthralled by Lars Dangly’s excellent Platemail – a RPG based on Chainmail. Now, my last Old School delving revealed two other precious jewels. Both are, in a way, “Alternate History” versions of D&D. The first one I already knew for some time, but only came to proper appreciate it now, after reading about Gygax’s ideas for a new AD&D edition. I’m talking about Joseph Bloch’s Adventures Dark & Deep, a great “what if” game, showing a different evolution and design philosophy after AD&D 1st Edition. The game has a stronger medieval flavor, and I was especially attracted by new classes, like the Jester and the Mountebank. My second “discovery” is Daniel Hugh Boggs’s amazing reconstruction of the Dave Arnerson’s “First Campaign Setting” mechanics. 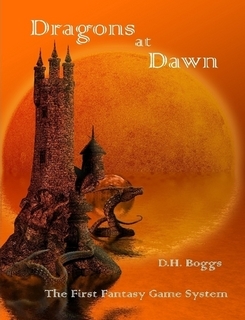 I’m talking about Dragons at Dawn, probably the most Old School game I’ve read until now and it reveals a different path that D&D might have took – a direction that, I believe, would better reflect Sword & Sorcery than High Fantasy. Wow! I noted only yesterday that I reached my 100th post. I never thought I would reach that mark, much less in such short time (for me at least). I just would like to thank all my followers and readers! And especially my multiclass love Mandy (high level girlfriend/wife); after all, it was due to her encouragement that I started this mad experiment. 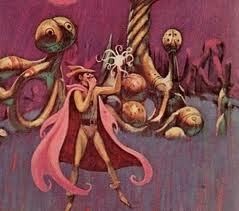 After having recently read Jack Vance’s masterpiece “Tales of the Dying Earth ”, I’m convinced that calling the D&D/Pathfinder magic system of “vancian” is a premature assumption. I actually prefer to call it “gygaxian”, but in the end that’s just semantics. 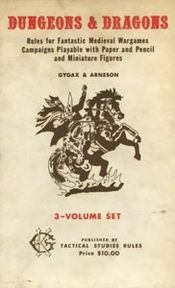 I don’t really know if it was Gygax or Anderson the main responsible for the original magic system, but I know that Gygax’s magic system for Chainmail was radically different (and, in certain aspects, closer to the way that spells operate at Vance’s novels). But, as usual, I’m digressing. In the Dying Earth universe, magic is closer to a form of hyper mathematic (or some kind of fallen science), than an authentic occult lore. Each spell is a very precise and delicate formula directed, maybe, to a universal machine or (semi) sapient cosmic entity. A computer code for reality, if you like. Even a tiny mispronunciation (or hesitation) can spell doom for the caster (no pun intended). The fact that a spell is in fact a type of “meta-code” that our brain can’t normally store and process, thus creating the whole dweomer “memorization”, is one of the Dying Earth’s basic premises. What I intent do here is a little “hack” for Pathfinder, emulating that idea (at last my vision of it). For example: differently from Pathfinder, Vancian spells can’t be memorized multiple times, there aren’t any level limitations and most dweomers are amazing specific in their effects (true magical versatility in the Dying Earth universe is left to a few archmages, like Rhialto or Idelfonse, normally through the use of sandestins). The house rules below are necessarily short and (I hope) to the point. They’re more like guidelines and definitely not a new magic system. Classes: Remove all spellcasting classes. Use the “spell-less” versions of classes like the paladin (from the Advanced Player’s Guide ) and the ranger (from KQ #11). Spells: Keep the spells from Pathfinder. All spells are of arcane nature and spell lists are kept just for Ability Score requirement purposes (check Step 4). Remove the Knowledge [Divine] skill. Learning Spells: Require 1 month per spell, 2 months for spells of 5th level or higher and probably more for 8th level or higher. Literacy is required. Read magic is removed. Spells are usually in dead or supernatural languages (Linguistics can be used to decipher them normally). A Spellcraft check (DC 15 + level) is rolled at the period’s end. Cantrips can be learned by any character with ranks in Knowledge [Arcana] after a week of study and a successful Spellcraft check (DC 10). Spell Memorization: Each spell can only be memorized once. An interesting side effect of this rule is that that multitude of damage-dealing dweomers will finally be useful. Grimoire (or better yet, Librams!) are the only way of memorizing spells. Each character can hold on his mind a number of spell levels equal to his Intelligence modifier. While there aren’t level limits to learn a spell, the spellcaster still must respect Ability Score requirements (i.e. Wis 15+ to cast raised dead and Int/Char 19+ to cast meteor swarm). Spellcasting: Requires a Spellcraft check (DC 20 + level). Each “spell slot” left “open” can be spent to add a cumulative +3 bonus to this check. Spellcraft isn’t a class skill anymore. It requires a feat to correct this (and personally I would forbid Skill Focus to be used for Spellcraft). A second feat enables you to add your Spellcraft ranks to your Int modifier to determine the number of memorized spells. Spellcasting Failure: Check the margin of failure and the following table. The spellcasting isn’t finished. Keep casting and roll again next round. Caster is flat-footed. Spellcasting fails and the dweomer is lost. The spell is cast but one of its parameters is randomly changed. The GM determines the exact details based on the roll below. The spell works normally, but the target is the caster. If he was the original target, pick an enemy or the closest appropriate target. The caster suffer the spell level in points of ability drain (use the Ability Score linked to the spell’s DC) and the GM has full liberty to choose a random effect of the same level and inflict it on the caster (like the summoning of an outsider). Poetic irony and heartless humor should be guiding principles here. Cantrips require a Spellcraft check (DC 10) to be cast, can be used at will (without memorization) and a failure doesn’t incur in any penalty. Spell Nomenclature: This is the most important rule! Add a fanciful name to even the simplest dweomer. In this system there are no magic missiles, only Xanadar’s Inerrable Force Darts. [Optional] Spell Potency: To better reflect the impact of spellcasting (which will be rarer here) I recommend increasing spell damage. [Optional] Rogue Talents: minor magic now adds +2 “slots” to your Int mod for memorization purposes, while major magic add +4. [Optional] Magical Healing: Because we don’t see this kind of magic very often in Dying Earth I suggest using the house rule that all healing attempted through dweomer convert lethal damage to nonlethal damage. If you allow resurrection, you can also house rule some dire effect (like the target coming back with one extra age category). My inspiration for this new dweomer was the Bleaching of Golarion's gnomes and, as usual, the goal to strive for the strange and the bizarre: a spell that removes color both physically and metaphorically sounds pretty weird for me. You drain all vivacity, emotions and feelings from the target with this strange dweomer. The target becomes immune to any effects that depend on emotions, like fear and morale bonus, including class features like rage. Consumed by ennui, the target suffers a –4 penalty on all his social checks. The total lack of commitment also changes the target's alignment to True Neutral while the curse remains. Finally, as a side effect the target loses all color. His clothes, hair, eyes and even skin turn to shades of gray. Golarion's gnomes are especially vulnerable to this curse, suffering 1 point of Constitution drain per day (no saving throw) and a 25% miss chance to every action attempted due to an overwhelming apathy. The curse bestowed by this spell cannot be dispelled, but it can be removed with a break enchantment, limited wish, miracle, remove curse, or wish spell. Bestow curse counters remove curse. "Lo! I am made young again when I recall Commoriom, when in this grey city of the sunken years I behold in retrospect her walls that looked mountainously down upon the jungle, and the alabastrine multitude of her heaven-fretting spires. Opulent among cities, and superb and magisterial, and paramount over all was Commoriom, to whom tribute was given from the shores of the Atlantean sea to that sea in which is the immense continent of Mu; to whom the traders came from utmost Thulan that is walled on the north with unknown ice, and from the southern realm of Tscho Vulpanomi which ends in a lake of boiling asphaltum. Ah! proud and lordly was Commoriom, and her humblest dwellings were more than the palaces of other cities. And it was not, as men fable nowadays, because of that maundering prophecy once uttered by the White Sybil from the isle of snow which is named Polarion, that her splendor and spaciousness was delivered over to the spotted vines of the jungle and the spotted snakes. Nay, it was because of a direr thing than this, and a tangible horror against which the law of kings, the wisdom of hierophants and the sharpness of swords were alike impotent. Ah! not lightly was she overcome, not easily were her defenders driven forth. And though others forget, or haply deem her no more than a vain and dubitable tale, I shall never cease to lament Commoriom." Passages like these, from The Testament of Athammaus, give me tons of ideas and hooks for campaigns. The lyricism of CAS never ceases to amaze me. This particular snippet, resounding with doom and loss, make me wonder how the Player Characters would react if their world setting was, suddenly, struck by such ominous prophecy. I don't mean something in the indefinable future (as in most White Wolf settings, like the old World of Darkness and Exalted), but a concrete event, for example: "The lands shall fall beneath demon waves with rising of the Red Eye, on the thirteenth moon to come!" That's what I'm talking about here: an ultimate deadline. The PCs should be able to literally see it coming. Imagine well-know campaign settings, like Faerun, Oerth or Golarion consumed by an eschatological event. How would the various races, cultures and pantheons react? This is great background material for any campaign focused on a different feel and approach (or as a way to deal with the famous – and dreaded – Gamemaster’s burnout). I titled part of this post as “Setting Events", but I think I could also call it “Setting Templates” because that is how I see they working in my home games: a chain of events around a well-known or strong theme, that can be universally applied to any campaign setting. If I remember correctly the idea isn't exactly new and was used by Monte Cook's Malhavoc Press in Requiem for a God and When the Sky Falls. 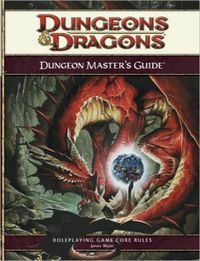 These sourcebooks (for D&D) detailed a number of causes, consequences and mechanic for two particular and wide-ranged effects: the dead of a god and a meteor strike. 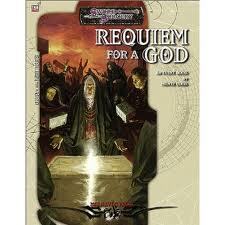 - The End of Times: You can use either the classic Monotheism eschatology or the Ragnarok-style divine onslaught. Most campaign setting already provide enough material for both kinds of events, like abundant rivalry between certain deities and legends pertaining to old chthonic forces ready to rise back and rock the world’s foundations. The difference here is that you are actually making these legends come to a conclusion. This doesn’t need to be the literal end of the cosmology, for the character can just as well witness the birth of a new cycle (like the Norse or Indian myths). - Ice Age: Since Magic The Gathering I’m a fan of this approach. Just cover the entire world in a magical nuclear winter and let mayhem ensue. It’s amazing how easy it is to predict the reactions of famous races, cultures, deities and NPCs. For example, in Faerun we could see a mass migration to the Southlands, with the civilized races running from the massive humanoid and giant hordes (themselves running from the things a lot worse leaving the old frozen north). Maybe the weather alteration can also change cosmological and planar characteristics, like strengthening ice magic and themes associated with cold and winter. - Invasion: Pick the classic monster or humanoid horde (every setting has one) and let their next invasion works*! Create an orc empire, giant feudal states or a dragon dominion in the middle of the player’s beloved setting. 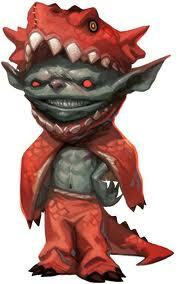 And don’t forget the classical githyanki invasion from the Astral Plane using red dragons. Another cool invasion (now totally stealing from science fiction) is a massive force of mind flayers (or neogi or ethergaunt) coming with spaceships (either spelljammers or real spacecraft, both work fine!). If you want a crazier example, try an invasion from a parallel reality: my favorite tactic here is to use an “anti-setting” – a reverse world where, for example, the good guys from the PCs setting are the bad guys (orcs could be a powerful and civilized race while deities like Lathander or Heironeous could be totalitarian sun-gods with an “Old Testament” feel). - Wasteland: In many ways this Setting Event works like an “inverted ice age”. Instead of freezing, everything burns and dries. Think of Dark Sun, but use your favorite setting races and geography. Better yet, let things get really interesting by mixing themes. For example: technology. Maybe a planar rifts link the world with a dimension where technology is the ruling force. Ta-da! Instant mash up between Pathfinder/D&D and Gamma World. Of course, you can keep things strictly “magical”, but draw inspiration from the post-apocalyptic genre. Establish that the massive use of magic created a chaotic world where constant planar rifts appear and disappear (pick a plane and fix it to the world, like Mike Mearl’s excellent suggestion of using the Abyss as a location in the setting, instead of a plane); create “mutations” generated by some form of concentrated magic material (like a dust or metal); make desertification works in bizarre ways (working like areas of high magic, where spellcasters rule almost as kings, but are subject to be possessed by horrendous Things From Beyond); establish that too much spellcasting can open small rifts and summon outsiders (the barrier between realities is very really thin here). - Exodus: This is a simple event but it holds also great potential. Maybe a massive flight of dragons descend on the PC’s world, forcing a massive dislocation of a race or culture. Maybe a god dies and his body spreads a plague over a region. This event can start wars and alter the way old allies or enemies interact. It can even start new religion or legends – about the fabled “promised land”, or haven, beyond the mountains (or seas or deserts). Other potential trigger event for an exodus is the sinking of a continent (the players will surely love to actually witness one) or the retreat of an ocean (revealing dark things). - Zombie Plague: I couldn’t end this post without mentioning this one. Every setting has a dark deity or force devoted to undead, so I can only assume that it would be interesting (and very funny) to see it finally winning at least once. Myrkul, Orcus, Nerull, the Whispering Tyrant… pick your champion and start rising the dead. Use infection rules (and easy access to necromantic magic that enables resurrection with “collateral effects”) to guarantee the proper mood and let the players hunt for a solution. *Actually, this advice about “let it work this time” should hold true for all the Setting Events above. Want to see what I think to be the “wrong” way of doing this? 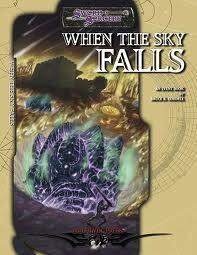 Check the various editions of the Forgotten Realms, where we have all kinds of apocalyptical events, but they rarely change anything or – more important – when they do it is for the wrong reasons (usually following the eternally dumb “lets-sell-more-books-to-new-players” mentality). I’m traveling out of town, for the Easter holyday, to meet my family and girlfriend, so my next post should probably be up only on Monday. Until there I’d like to take this opportunity to ask you about what types of article do you enjoyed more here at the Tower (or found more useful)? Checking the blog stats, I saw that the Auguries received the majority of hits, followed by Pathfinder rules and, a little behind, Worldbuidling articles. Weird Arcana gets always a little attention and I keep it because I find it extremely fun to create spells, the same been valid about Little Encounters. The Bestiarum Vocabulum occupies the last place, but I still want to adapt a few more creatures from the Malazan Book of the Fallen and, maybe, from other books I’m reading. A curious pattern that I noted is that whenever a post has a title with the words “Old School”, it is an instant hit. It’s amazing the strength of the OSR at the Internet (in comparison with Pathfinder). Actually, I got the impression that Pathfinder fans are not as scattered as Old School ones, been concentrated mostly at Paizo. So, please, feel free to post any suggestion here or to send an email to me (tzimiscedracul at gmail dot com) about anything you’d like to see at the Tower in the future. I’m also searching for other Pathfinder blogs out there so, if you have any recommendations or suggestions, please let me know. Finally, while this is (today) a Pathfinder blog, lately most of my reading has been of Old School games and OD&D, so I’m preparing a little post with a “Hobbit-Hack” for Swords & Wizardry (my favorite retro-clone). I’m also writing (now for Pathfinder) an alternate version of the druid class (the shaman), two versions of a swashbuckler class, my interpretation of a “true” Vancian magic system and an article with abstract mechanics for Followers (this one has given me some trouble). So, these are my thoughts for now. I wish a nice week to you all! Happy Easter celebrations and great games! P.S. 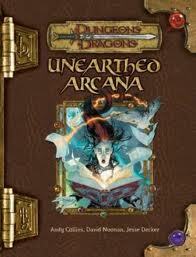 : I just saw this homebrew PDF, modifying D&D for kids, at the The Contemptible Cube of Quazar. It is a marvelous introduction to the hobby. 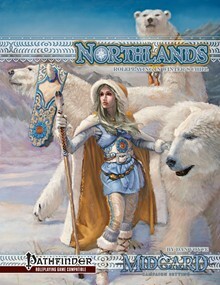 Northlands, Roleplaying in Winter’s Chill, is a Pathfinder sourcebook for the Midgard setting that support adventures in the frozen north, based on scandinavian, slavic and even greek mythology, as well as the classic viking legends from Medieval Europe. Northlands follow the design principles of Wolfgang Baur’s new campaign setting, with a darker, more primeval and mature approach to well-known themes of fantasy, besides drawing inspiration from lesser recognized sources (like german myths). Northlands is a B&W softcover with 110-pages. This book is, literally, full of material. It also has, in my opinion, one of the most beautiful color covers so far for the Pathfinder RPG (yeah, I’m comparing it with Paizo’s top-notch art). Northlands’ first chapter is also the most conventional. In approximately 10 pages it neatly condensates the classical elements of what most gamers would call “viking culture”. It may not be a history class, but it certainly has enough material and information to start a campaign and impart the local culture and society to your players (in fact, I would use Northlands, at first, as a foreign culture in my campaigns). Chapter Two details the north continent of Thule, in the Midgard setting. We get information on its most common races, a little bit of history and legends, and a general description of the main regions. Northlands describe places full of references to myth and literature, like the Phantom Isles, Jotunheim, the Plains of Rhos Kurgan, the Kingdom of the Bear (a realm of bears! ), Trollheim, Hyperborea (one of the book’s best ideas, with inspiration draw not only from myths but also pulp fantasy) and the Land of the Falling Wall (I don’t know if it is a homage to Jack Vance, but I surely love it!). The book also details traditional races of Pathfinder, incorporated in the northern mythos, like the sea-faring reaver dwarves and the cursed elven domains of Thorn. Chapter Three is for player characters. We have new human races (Kazzakh, Donneren, Skraeling, Trylleri and Hyperborean – the last one with new stats), one new dwarf race (reaver) and the trollkin (a catchall term for the monstrous offspring of humans with trolls, fey and ogres). Northlands introduces achievement feats – stronger talents that can only be bought after some great deed is accomplished and, most important, recognized by the council of the character’s village or location. It’s a nice way to tie a setting element to the rules. An example: the Giant Killer achievement feat grants an insight bonus to attacks against giants proportional to their size in relation to your character (“the bigger they are…”) and also treats you as a size larger for the purpose of combat maneuver checks. However, it requires that you survive 10 awesome blows, bull rushes, overruns, or similar manuevers from giants (of at least two size categories larger than the character) and that you deliver the killing blow to 10 giants. Chapter Four is about magic. 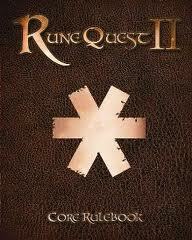 Beyond detailing new spells and incantations, Northlands also introduce rune magic. Rune magic is based on feats and can be used by any class. A rune gives a base bonus, the ability create certain magic items and access to three thematic powers (almost like a domain). Each step requires a feat. The Rune of Travel (“Raido”), for example, increases your speed and always let you know which way is north (base bonus), let you manufacture (for example) items that improve speed and, finally, grant to powers the deal with movement (beginning, at 1st level, with a situational bonus to checks involving ski, sleds and similar ways of transportation). The most interesting aspect of Rune Magic is that these feats require a symbolic quest to be acquired – like slaying a magical beast associated with the rune. Again, an intelligent application of the rules. One particular aspect of Northlands that I enjoyed is its magic items section: it has 9 artifacts, each one inspired in northern mythology and a campaign in itself. The next chapter is devoted to campaigns, with specific information about survival, weather, encounters, chases, foods & drinks, hazards, magical locations, haunts and a variant rule for hero points, called Fate Afflictions. This last one is a rules-light attempt to simulate the way that Fate (through the mythological Norns) interferes in the lives of northern heroes. Wisely, it let the choice of accepting the limitations of a fate to the player. Chapter Six is the bestiary and opens with the avatar of Boreas, God of the North Wind, a CR 17 monster and the first deity with stats for Pathfinder that I’ve seen. While some may object, I enjoyed the new approach and scale, much more useful to the majority of the campaigns that I know. 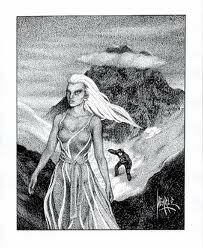 There also new types of giants, magical wolves (and similar beasts), ice maidens and (of course) valkyries. What I can say? After Zobeck with its delicious simplicity and originality, Northlands is by far my favorite sourcebook from Open Design. It is, without a doubt, at the same quality level of Tales of the Old Margreve. It has a great deal of mechanical content, but its worth remembering that Northlands is the equivalent of the “regional sourcebooks” for campaign settings like Forgotten Realms or Eberron. 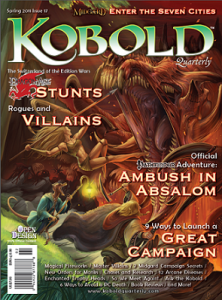 Kobold Quarterly #17’s editorial dedicate this issue to villains (and villainy) and gives, right away at its first article, probably one of best treatments to the subject. Michael Korte’s “So We Meet Again” presents a simple, yet intelligent, nemesis rule through the use of metagame powers. The choice of using or not these special abilities is left to the players. Each nemesis ability gives a special power to both the player character and its nemesis. They can be used “on the fly” and are a brilliant way to reward memorable NPCs. The next article presents famous cons and swindles, for rascals or thieves (practically systemless). Also on this side of the rules (or their absence) is “Lackeys, Hirelings and Henchmen”, a short but instructive text about these (un)important NPCs. “Its Not Supposed to End This Way” is one of my favorite articles of this edition and deals with an extremely interesting subject (consequences other than death to player character’s failures), although I did miss mechanical examples for some of the alternatives. “The Scourges of Vael Turog”, for D&D 4th, is an article about magical diseases, based on the tiefling empire of Caermalrath, from the Midgard setting. Some of the plagues are so powerful (or weird) that they work like hazards or monsters. Also for the 4th Edition, “Elf Needs Food Badly” is about magical foods – small effects (like potions) that normally are activated during short rests. Finally, we get four new monk orders (whose background can be used in any system), each with a new magic item. “Ambush in Absalom”, an official Pathfinder Society Quest, is a short chain of encounters in the sewers of the famous city. It can easily be incorporated in any urban adventure, and it reminds me of the Set-Piece encounters, from Paizo’s Adventure Paths. “Magical Squibs, Crackers and Fireworks” is all about magical pyrotechnical stuff (for obvious reasons it required a goblin illustration). “The Black Goat” is a nice variation on the tavern’s theme, by mixing it with a Lovecraftian monstrosity (and no, it’s not that lady). “Getting Ahead” is a great article about magical heads (including a new gruesome incantation). “On the Streets and In the Books” which expands Dragon Age ’s Stunt mechanics to chases and researches. And talking about DA, “Feats of Stunning, Might and Brilliance” show how famous the Stunt mechanics is and adapts the same design philosophy to Pathfinder and D&D 4th Edition. This is another highlight of this edition – I just wish the author had given some concrete examples. 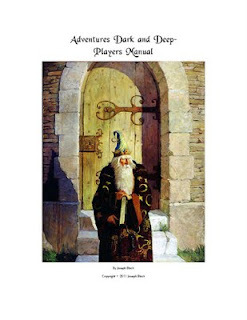 For those Midgard fans out there (including me), “Group Concepts” is a delicious read, about how to establish backgrounds for adventurers groups. Each concept is followed by tantalizing examples taken from the Midgard campaign setting, which are more interesting than the article itself. Monte Cook brings to us, basically, a “101 on Monster Creation” (systemless). While definitely useful to starter GMs, the article is too short and I got that impression that it was made just to fill this edition’s quota. KQ #17’s interview is with Jeff Tidball, the author responsible for, among other things, the eagerly anticipated Dragon Age Set 2 , from Green Ronin. KQ #17 got, at least, 3 articles of amazing quality that are worth alone this issue’s price. At the ends this is another fine number of what I still believe to be the best RPG magazine in the market. It definitely is the most egalitarian, when the subject comes to game systems, and it has been very interesting to watch the continuous rise of the Adventure Game Engine system (from the Dragon Age RPG). Ok, I probably should know better than intrude upon this subject, but… I just can’t resist. Today it’s already common knowledge that Hit Points should represent an abstract mechanic instead of reflecting real physical status of a character. That’s why official D&D/Pathfinder rules generally don’t care about any type of Death Spiral rule. Either you’re in, fighting, or you’re out, not fighting. Beyond this simple assumption, anything else is (or should had been) left to the hands of the Gamemaster. It’s easy to keep this mentality with the Original Edition and its subsequent games (like many retro-clones of today). The problem is with later editions, where the idea of “Hit Points mean Physical Vitality” are so strong that many d20 variants actually create subsystems to deal directly with this (like the famous Vitality/Wounds system from the first Star Wars d20). We also have the additional complication that the official healing rules reinforce Hit Points’ recovery as wounds treatment. Ironically, the so criticized 4th Edition of D&D actually helped in this regard with its Healing Surge rule. So, what I’m proposing to do here is: I’m going to take the Hit Points rule and really try to use it as an abstract mechanic. Hit Points now represent only your capacity to keep fighting. Nothing else. They don’t mean vigor, wounds, physical vitality etc. How am I going to do this? I don’t have a clue so, please, just bear with me (and forgive my lack of practice with English). First rule: Hit Points are your fighting durability, just that. Out of combat, they don’t come into the game. During combat, when your HPs hit 0, you’re out of battle. That could signify that your character is unconscious, bleeding or just knocked down. Because of that, HPs don’t go below 0. Whenever your character’s HPs hit 0, further damage goes to Constitution (i.e. you’re really wounded). If you suffer such damage, make a Constitution check DC 15. Failure means you’re down. Failure by 5+ means you’re bleeding and have 25% of suffering 1 point of Con damage each round (75% per minute). A success by a margin of 5 or more means you can keep fighting, but you’re staggered, fatigued and – most important – any damage you suffer goes right to your Constitution (Undead and Construct suffer Strength damage). As you can see, your Constitution dictates your physical health. If you’re an Undead or Construct, your Strength determines your physical resistance (you could even house-rule this and let these creatures use their Str modifier to Fortitude checks against attacks like disintegrate). After any combat encounter, all characters involved are restored to half their full HPs (if below) after a short minute of rest. They also recover their character level (and Ability Score modifier) automatically after each hour (resting or not). If they rest completely for one full hour, they recover all their HPs. Since Hit Points have nothing to do with vitality anymore, we’re going to use a new rule to determine a character’s HPs total. Hit Dice stay the same, the difference is the Ability Score modifier used. Instead of Constitution, use the main Ability Score of your class. Yes, this is a little radical, but think about it: HPs represent the capacity to stand against your enemies in a fight. In a battle, a Fighter will use his Strength to better block and withstand blows; a Wizard his higher Intelligence to change his stance and pick a better position to defend himself; a Rogue will use his Dexterity to evade in the last instant an otherwise fatal blow etc. Remember: it’s an abstraction of your fighting capacity. Alchemists, Summoners, Witches and Wizards use Intelligence; Barbarians use Strength or Constitution (choose one at 1st class level); Bards, Oracles and Sorcerer use Charisma; Cavaliers, Fighter, Paladins (Anti-Paladins) and Samurai use Strength; Clerics, Druids, Monks and Ninja use Wisdom; Gunslingers and Rogues use Dexterity; Magus use Strength or Intelligence (choose one at 1st class level); Rangers use Strength or Wisdom (choose one at 1st class level) – these are just my personal guidelines, use the Ability Scores that better suit you. An important rule: damage to Ability Scores has no consequence to Hit Points. Don’t readjust your HPs total if your suffer damage to your main Ability Score. 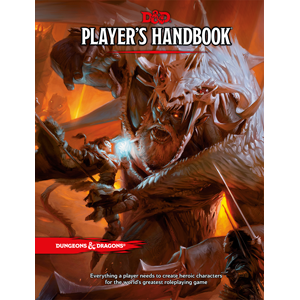 One intentional consequence of this rule is that player characters will have more HPs, which is good for the traditional heroic feel of Pathfinder. Actually, with HPs been now an abstract mechanic, it becomes easier for the Gamemaster to adjust the game to his liking. Do you want a horror-style game? Just remove any Ability Score modifier from the character’s HPs total. Nonlethal damage would work normally under this rule and are fully recovered after one minute of rest. Due to the new nature of Hit Points, I suggest removing the -4 penalty for delivering nonlethal damage. It becomes a matter of choice rather than a tactical option. In fact, you can simply remove nonlethal damage altogether from Pathfinder. Each time a character attacks he can opt to make a “nonlethal attack”, if it deals more damage than the target’s Hit Points, he doesn’t suffer Constitution damage. Another rule: coup de graces. These attacks do damage directly to Constitution. Now, an important observation: if a target is completely defenseless (not necessarily unconscious), they also suffer damage directly to Constitution. This include things like a hidden orc archer in the woods (the classic example that started the so-called “sniper rule”, from the Forge of Fury module, back in the days of D&D 3.0). How about monsters? My suggestion is to keep using them (and NPCs) as written. They’re already balanced to the game’s CR system and work just fine with this new perspective. But, if you insist, you could try to readjust monsters’ HP total by picking a new Ability Score modifier based on its type (Giants could keep using Con; Aberrations could use Int; etc). Finally, an aesthetic but necessary change: all “Cure” spells are now renamed to “Battle Reinvigoration”. “Cure Light Wounds” would now be called “Battle Reinvigoration I” (Ok, the name isn’t good; this is just a suggestion to better reflect the new mechanic). You may note that with these rules the Channel Energy class trait doesn’t make a lot of sense anymore. You could argue that positive energy boost a creature’s “resistance and will to fight”, but I prefer to change the rule. Channel Energy now only deal damage or “reinvigorate” Undeads – its more easy for me to explain how an evil priest can increase Undeads’ vigor during a fight with negative energy. To compensate for this loss, you can give to positive-channeling Clerics either Turning Undead or Alignment Channel as bonus feats. Another option is to let these Clerics use their Channel energy to heal Constitution damage (each dice of Channel Energy heals 1 point of Con damage). And the Bard? Now that HPs are an abstract stat, it’s reasonable to assume that bard music can “encourage and inspire” allies during battle (i.e. recover HPs). Actually, I was always a fan of this approach (even with the traditional HPs rule). When the Bard uses Inspire Courage he also lets each ally recovers a number of HPs equal to 1d4 per round of performance. This bonus increases at every four levels the Bard has attained beyond 3rd (to a maximum of 6d4 at 19th level). Every critical hit requires a Fort save (DC 10 + ½ the AC hit by the attacker). Failure means the target also suffer Con damage equal to the weapon dice plus its critical multiplier, minus 1. For example: a longsword (1d8 damage, x2) would deal 1d8+1 Con damage; a battleaxe (1d12, x3) would deal 1d12+2 Con damage. Once per day, you can spend a standard action (that doesn’t provoke an attack of opportunity) to recover 25% of your hit points. Fighters can catch their breaths more often per day. They can do it a second time at 6th level, a third at 11th level and a fourth at 15th level. As a variant of a variant, the Gamemaster can allow all classes to gain extra “breaths” per day. Just give them an additional “breath” for every extra attack they gained through BAB advancement. If you think the coup de grace rule is too brutal (and it is), you can allow defenseless targets a Fortitude saving throw (DC 15 + Con damage) to reduce any damage by half. Variant Rule: Life Points, Body Points, Vitality, Vigor, Wounds etc. This goes a little against the point of these rules, but if you think that characters should get more resilient when leveling up create a new stat called Life Points (or another similar name). Your Life Points represent actual injuries to your body sustained through battle. You can support a number of Life Points equal to your Constitution + your character level. If you lose even one Life Point you are instantly staggered and fatigued. You also must roll a Con check to stop bleeding. If you’re out of HPs you risk going down and out of battle normally. If you’re defenseless, all damage goes to Life Points. Your Life Points recover like normal ability damage. If you suffer Con damage, you lose an equal number of Life Points. If either your Life Points or Constitution reaches 0, you’re dead. Again, you can modulate this rule to better adapt the game to your needs. Another option is that Life Points equal your Constitution + ½ your character level or – my favorite – Constitution + your BAB. This rule is very reminiscent to the old Vitality/Wound system to my liking, but may enjoy it. Here are two other options to implement nonlethal damage as seen in Pathfinder. Both rules require a new stat called Bloodied. This means the thing as in D&D 4th Edition: half of your maximum HPs. If you suffer more nonlethal damage than your current HPs or your Bloodied stat (whichever is lower) you’re either staggered or removed from battle automatically (no Constitution check to keep fighting). The second option lends a lot more strength to the nonlethal damage rule. The first option gives a little tactical advantage; if you’re using the first option remember that the target is automatically removed from battle once his nonlethal damage reaches his current HPs. A particular consequence of the new Hit Points rule is that they no longer reflect general resiliency or vitality. This is done by the Constitution Ability Score. Fire, acid, poison, asphyxiation, deprivation and types of environmental damage now go to Constitution. A little perspective is important to implement this rule. An example: if an enemy is using a lit torch against you, you lose HPs normally (the fire damage doesn’t go to Con). The same holds true to a wizard casting fireballs – these spells are meant for battle and should be interpreted in a cinematic way (if you don’t agree with this, then you really should search for a different variant system, like the classic Grim’n’Gritty). Now, if a character is thrown in a giant sacrificial pit, he should suffer damage directly to his Con (from the burning embers at the deep of the pit and from the fall). The pit is not part of the combat, but a scene trapping (and thus environmental damage). An exception to the statement above is that using poison or acid (not an acid magic weapon!) always deal Constitution damage. This is a design decision done to reinforce these genre tropes: acid and poison are usually stupidly dangerous in fantasy novel and myths. Below I suggest some Constitution damage values caused by environmental damage. These tables were based on Runequest (actually Mongoose’s Runequest II) and should be used just as guidelines. When creating new environmental damage values, try to remember that in D&D a normal human has a Constitution of 10-11. Note: Water let you ignore the first damage dice. Variant: A character can attempt a For save for half damage, DC 15 + Con damage. *I recommend fire damage to be dealt not every round, but once per minute (or every three rounds, Gamemaster’s call). I’m gonna be honest here: I rarely keep track of these rules and use them more for dramatic purposes. So, instead of elaborating different tables, I’m providing a simple progression (from the acid rules): 1d2/1d4/1d6. Use these to simulate these conditions, adjusting the time period to the particular circumstances. For example, the official Pathfinder rules state that a character can survive without water 1 day plus his Constitution score in hours. After this period I would deal 1d6 damage every 12 hours (or 1d6 per hour in a hot desert). Likewise, after 3 days without food I would deal 1d2 damage per day to the character. If he’s exerting himself I would increase this to 1d4. Heat and cold can easily be simulated with this philosophy. I recommend detailing damage caused by these factors, to better recover them if the character finds some shelter or food (instead of using the traditional 1 point of Constitution per day). You think the rules above are a lot of crap? (They probably are…) If you do, I thought about a second and easier option to reflect Hit Points’ abstract nature. Just use the Reserve Points rule from Unearthed Arcana together with the design philosophy behind Trailblazer ’s rest rules (I recommend that for every one hour of rest, all characters recover 50% of their Reserve Points). Sunken Empires is an Open Design sourcebook for Pathfinder devoted to “treasures and terrors of the deep”. The theme is old, but eternally appealing to me. Actually, even after reading tons of RPG material about ancient empires, I’m still a total sucker for the subject. 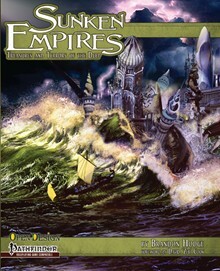 Sunken Empires is a 79-page softcover, with a stunning color cover by Malcom McClinton. The interior of the supplement is B&W, albeit with good art and a beautiful layout. The book opens with an introduction by none other than David “Zeb” Cook, talking about one of his most famous creations: aboleths. It’s a little piece of hobby history that most will find very entertaining (and useful). The first chapter is a nice rundown by the author about the three most famous “sunken empires” myths of our world: Atlantis, Lemuria and Mu. Each mythic location gets approximately one page of text and is explained in a very clear and direct way – definitely a bonus, because readers with a deeper interest for the topic can search more specialized books (like GURPS Atlantis or Altantis: The Second Age). At the chapter’s end we’re finally introduced to the lost civilization of Ankeshel, created by an eldritch advanced human race (or half-human, the legend is unclear) with the help of strange “masters” from the depths (guess who?). The second chapter is mechanical, about “pelagic characters” (ocean-themed PCs). We have a new race (half-merfolk), alternate class features, new feats, cleric domains, rogue talents, sorcerer bloodlines (vril sorcerers!) and even a new wizard school. The third chapter is one of my favorite parts – items and lost technology. The “items” part is what you would usually expect: weapons and armor for underwater combat, diving equipment etc. Of course, we also have our quota of strange stuff: skum essence, vril cream and shoggoth polyps are good examples. Now, the meaty part: technology from ancient and advanced civilizations. Here we have firearms (with some new rules options), cryothermic weapons, charged armors, vril batteries (and vril coils), arc lights, dimensional disruptors… this part practically sold Sunken Empires for me, with is excellent blend of Stargate-like tech and magic. We also have a new material: orichalcum; with some suggestion of how to use it in your campaign. The next chapter is your usual section about new spells and magic items. Chapter five details environmental rules for the underwater adventures and gives new encounter tables. Chapter six is a bestiary with all kinds of critters, including coral drakes, the cnidari (the evil invader race from below), goblin sharks, isonade (your classical kraken/leviathan) and aquatic variants for other creatures. The chapter concludes with an “ecology of the aboleth” article. The use of the aboleth and the book’s thematic connection with the Atlantis mythos led me to believe at first that Sunken Empires was an official product for the Pathfinder setting of Golarion – where also have a sunken empire created (and destroyed) by aboleths, Azlant. This initial confusion may lessen Sunken Empires in terms of originality, but in no way is a negative point of the product. Quite the contrary, the lost civilization of Ankeshel can be easily adapted to Golarion’s Azlant or it can be used in other settings (like Open Design’s Midgard). Sunken Empires in an outstanding supplement and I can hardly wait for Northern Empíres, the next book in the series. Worldbuilding - Bring out your Sorcerers! My (White Box) Precioussss is here!